There’s something otherworldly about cruising the Yasawa Islands off the northwest coast of Fiji. To see villages with no electricity or running water, no phone or appliances, or other amenities is almost disconcerting coming from a society that takes these things for granted. In one village of 200 people, the children play along the beach, or between the grass huts. They have no toys. They travel 20 minutes by boat to an elementary school in another village. When they pursue higher education, they attend high school on the main island. They’re shipped off to stay with relatives, or live in a boarding school. They take jobs, and rarely return. There’s nothing for them there, nothing left to motivate them to hold on to their old way of life. Their families cook and eat their meals outside on the ground, and then retire to thatch-roofed huts with very little furniture. For the most part, the villagers are fishermen. They sleep in hammocks, or on reed mats. There is no glass in the windows, no locks on the doors as there are few trappings of wealth in this simple society which time has passed by. During our visit the villagers hold a kava ceremony and perform a Meke (meh-kay), consisting of traditional ballads with symbolic movements to conjure legends, love stories, spirits, and the fanciful native history of Fiji. 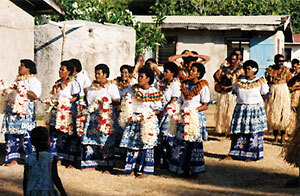 The Vakatara, men who comprise the orchestra sit and chant, while the Mata Ni Meke, or Matana – the women – do the interpretive dancing. Grass skirts, and tie-dye sulus (wrap-arounds) are the order of the day. The kava ceremony is almost a religion in its own right. Made from the ground roots of the pepper plant, and when mixed with water, kava is a turbid brown liquid claimed to have medicinal properties and a relaxing effect. The chief mixes the brew with his hands in a communal bowl, then scoops out a cupful, and offers it. Before drinking, the recipient claps hands once, downs the liquid in one gulp, claps three more times, and says, ‘Bula’ (Fijian for hello). He hands the cup back, the chief stirs the liquid with his hands again, and fills the same cup for the next participant. I have two cups. It tastes like India ink. I feel a slight tingling in my mouth. Our closest link to the modern age is the Yasawa Princess, our Blue Lagoon cruise ship for 40 passengers and 20 crew. Staterooms are well appointed with a three-piece bath, air-conditioning, and a porthole to gaze at passing islands. The food in the dining room is first-rate. Even onboard, there are few modern conveniences. By day, cards, conversation and the scenery, are our only entertainments. Crewmembers play guitar and serenade us in the evenings. Bures, simple thatched huts, are still in use on many Fijian islands. At Nasimasima on Nacula Island, the land is parched and brown. The rainy season is late, and the shrubs rattle in the wind as we climb to the top of a hill. The stiff, grey limbs of the trees creak and groan as we watch the waves crest shoreward on the scrubby windward side. We view the island from a weather station used as an observation post in World War II. The Allies held this outpost to keep tabs on the Japanese fleet as it steamed toward the more strategic Solomon Islands. We head back to the sheltered beach for tea and Lamington’s, a decadent chocolate and white cake smothered in sliced coconut with a light cream filling. It’s sinfully delicious, especially with tea and particularly during a morning of trekking and wading in the surf along the sandy beaches of the Yasawa Islands. After our snack, we snorkel and swim amid blue, pink, purple and green coral in bloom. Sadly, the budding heads are struggling for life on a reef of largely broken and dead grey and brown coral. The fish – while colourful–– are timid and small, an indication of over fishing, and surprisingly for this relatively remote part of the world, too many tourists. Even as we watch, a diver snorkels by with a spear gun. The dart aims at a smallish fish, impales it, and bounces off the coral on the bottom. That night, we are treated to a spectacular sunset over the hills of the island. At first the light glistens whitely on the sea but as night approaches, the sun yellows, darkens to orange, then rapidly sinks behind the hills as a fiery red ball. The clouds and sky, tinted a pinkish, bluish-purple, deepens by the minute as the day wanes. 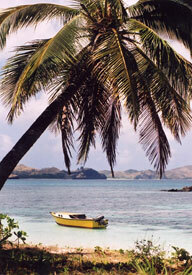 Next morning, we’re on Nanuya-Lailai Island: coconut palms, gentle breezes and wavy surf. We feed bread to goatfish, and watch them swirl around our legs. Snorkeling on a reef just off shore, we see purple starfish, yellow and brown damsel and angel fish, the aggressive trigger fish with its distinctive blue slash across its beige and yellow head. There are brown sea cucumbers, and more of the pink, purple and green coral heads. Back on the beach, we snooze in a hammock for two slung between trees. We read books in the on-shore breeze. We kayak, swim, and then circumnavigate the island. Passing local grass bures or huts, we follow the beach, which skirts the warm waters as they lap the shore. We walk knee-deep in the clear water looking for more sea cucumbers, and juvenile starfish, which are buried just below the surface of the soft, white sand. That night, we enjoy a Fijian feast or Magiti on the beach, with food cooked in a lovo or earth oven. Like a luau in Hawaii, or hangii in New Zealand, the food is wrapped in hand-woven baskets of coconut leaves, and then buried on hot stones covered in wet burlap bags and sand. A fire heats the stones for about two hours, and then the food is steamed for another four. We feast on fish, pork, and chicken, which falls off the bone, sweet potatoes, taro, cassava and tapioca, followed by sliced mango, papaya, bananas and other fruits fresh from the tree. As we dine by the light of torches under the stars, the music mingles with the cool night breezes. The evening is more meaningful because we know that the next day we’ll be tying up at the wharf at Lautoka, an industrial sugar and port town on the main island, where we’ll say goodbye to the Yasawa Princess, and our new found friends. Once again, the guitars will play, and the crew will sing as we hug and kiss everyone, collect our bags, and, in our otherworldly way, head off toward our next adventure.